Solidarity statement from the North American based Workers Solidarity Alliance. The rank-and-file workers have demonstrated the best aspects of the combative spirit of the working class, and may help ramp up the lagging spirit of solidarity in the American labor movement. We also condemn the actions of top union officials to control and suppress the fighting spirit of the workers involved. The official’s desire to narrow the struggle has come at a time when broadening the struggle is most needed. Instead of limiting the struggle to the public sector, it must be expanded to encompass the entire working class. Instead of accepting the concessionary demands of the state, it should be attacking the state’s corporate masters. For many years those in power have tried to paint the term “class war” as dirty words. For the past 30 years the bosses assaulted workers in the private sector. Year after year, decade after decade workers have seen their jobs decimated, whole communities destroyed and union bureaucrat after union bureaucrat surrendering to the boss class. After rendering most private sector industrial unions weak and almost useless, the assault now turns on to public sector workers. “Class war” can only be the way to describe wave after wave of attacks on working people. The class war being waged by the capitalists against working people is not limited to the public sector. The public sector is only the latest target. The politicians and their masters will not be satisfied until ALL working people are reduced to the level of indentured servants. 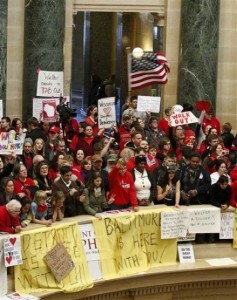 We recognize that the fight in Wisconsin, and elsewhere, is a defensive fight. A fight to stave off the worst of the bosses attacks. We also recognize the potential of rank-and-file workers from different worksites, institutions, agencies and industries and services informally talking together, networking, building worker-to-worker relationships, bonds and solidarity. These relations are key and cornerstones for building a fight-back. But rank-and-file workplace organization linking workplaces is also needed to carry the struggle forward and deepen the relationships. Whatever form these inter-workplace organizations may take, the key to enhancing our power is by making sure they are membership controlled and organized from the bottom up. We call on all workers, public sector and private, to unite in solidarity and fight back against the politicians, the capitalists and union bureaucrats, to build a grassroots workers movement from below that demands nothing less than everything. The fight will not end in Wisconsin. It’s only the beginning.